Recently, when I didn’t feel motivated to navigate the hordes crowding into the more trendy local farmers’ markets, I headed out to Finley Avenue and Birmingham’s old Alabama Farmers Market (www.alabamafarmersmarket.org), a sprawling complex of open air sheds and rows of warehouses where truck farmers sell their seasonal harvests 24/7 and resident vendors display their agricultural products. As far back as I can remember that big farmers market has been on Finley Avenue in Birmingham’s westside. 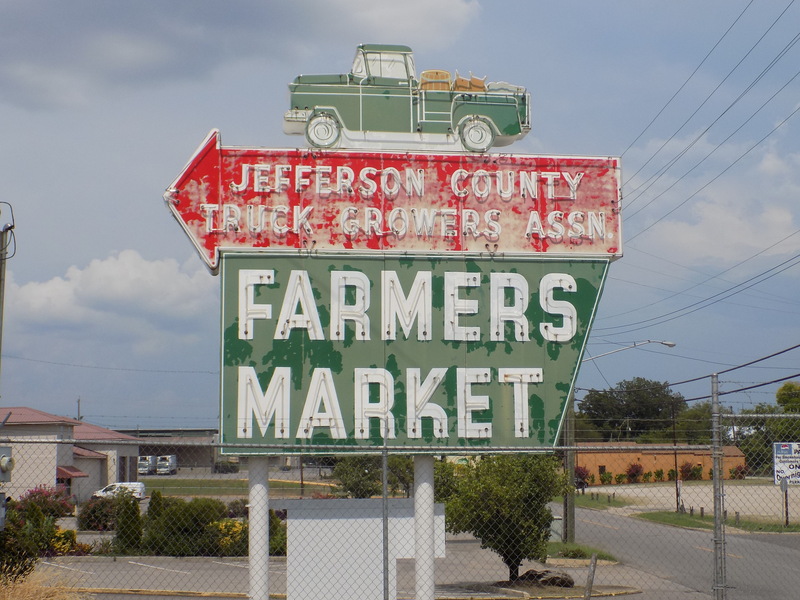 The Jefferson County Truck Growers Association formed in 1921 and the Association’s Alabama Farmers Market moved to its Finley Avenue location in 1956. When I was a child we would take Grandmother Harbison to Finley Avenue where she would stock up on fresh produce for the amazing meals she seemed to always be cooking. She would also can and “put up” for the winter in the big chest freezer down in the basement. Grandmother seemed to always have a large pot of homemade vegetable soup warming on the stove no matter the season. I am an ardent supporter of local food and community farmers; I might hit three farmers markets over the course of any given week during the warm months. I’m talking about those weekly pop-up markets with farmers selling their wares in avenues of tented stalls for three to five hours. If you pay attention, you can find such markets almost every day of the week at a church or parking lot near you. These weekly neighborhood markets have become ubiquitous and popular– which is great — and many have expanded to include artisans and musicians, deejays and demos. I used to feel refreshed after a Saturday morning stroll through Birmingham’s Pepper Place Market but these days I mostly feel stressed and relieved to get away from too many people, too much noise, animals and their people hogging the pathways, and unnecessarily wide baby strollers. The carnival atmosphere begins to distract from the market’s original purpose to get local food to local residents. So it was a refreshing change to go out to Finley Avenue after too many years away and get back down to just the basics of a farmers market with growers selling off the backs of trucks. The mechanical pea-shellers were cranking out bushels of peas in mere minutes. Some vendors featured rows of canned items with assorted pickles, local honey, chow chow, soups and such. 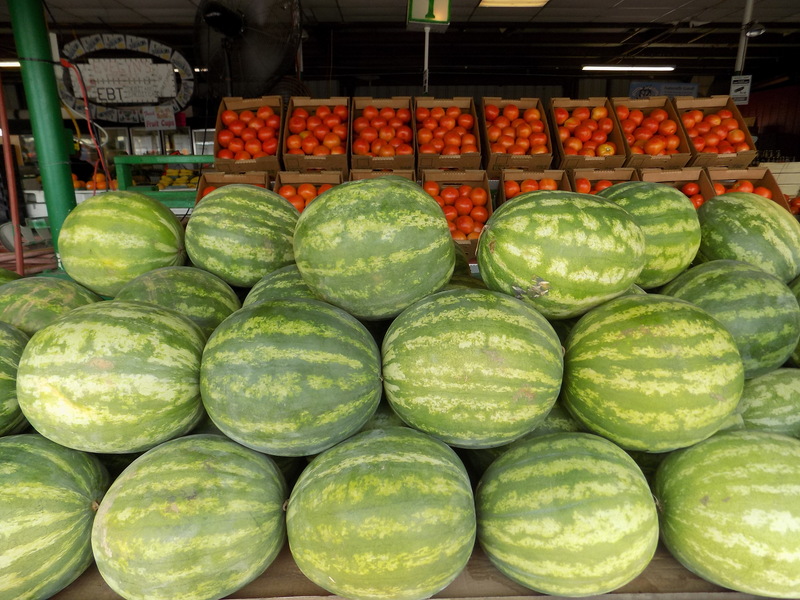 In August there are abundant mounds of watermelons, cantaloupes, and tomatoes. The sights, sounds, and aromas took me back to a time when farmers’ markets were less abundant but the shoppers were probably more earnest about their fresh local food. 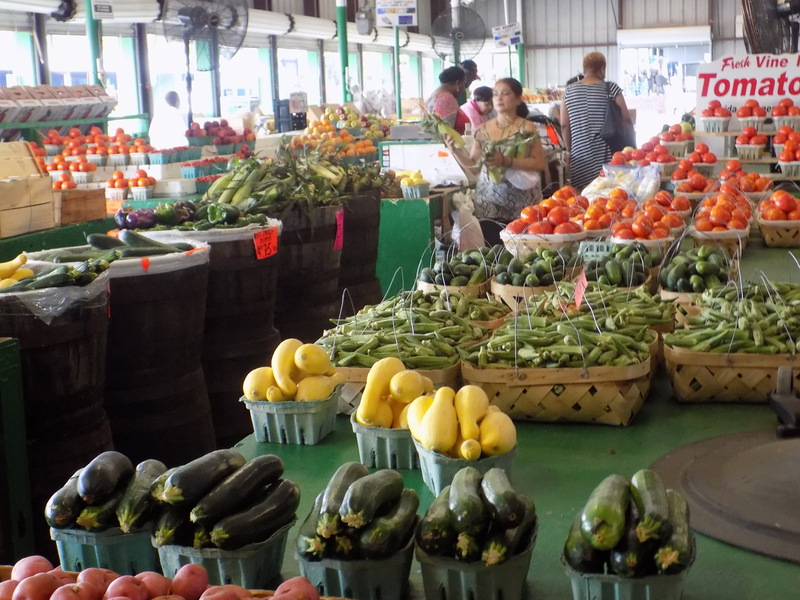 The people who frequented these markets weren’t just seeking out the coolest heirloom tomato (I’m a fan of heirloom tomatoes, too, by the way) but were focused on the values of locally sourced food and finding ways to feed a family in healthy, sustainable, and economical ways. 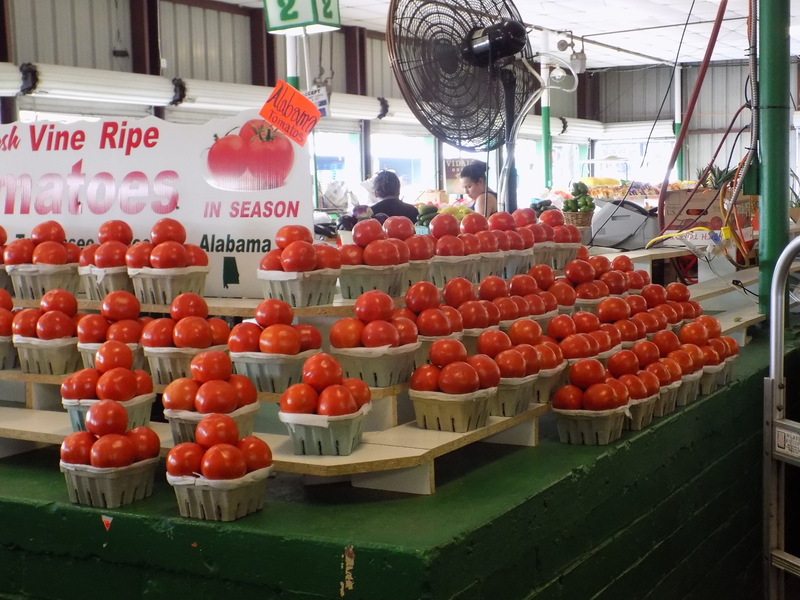 The originals like Alabama Farmers Market on Finley will be around for a long time. 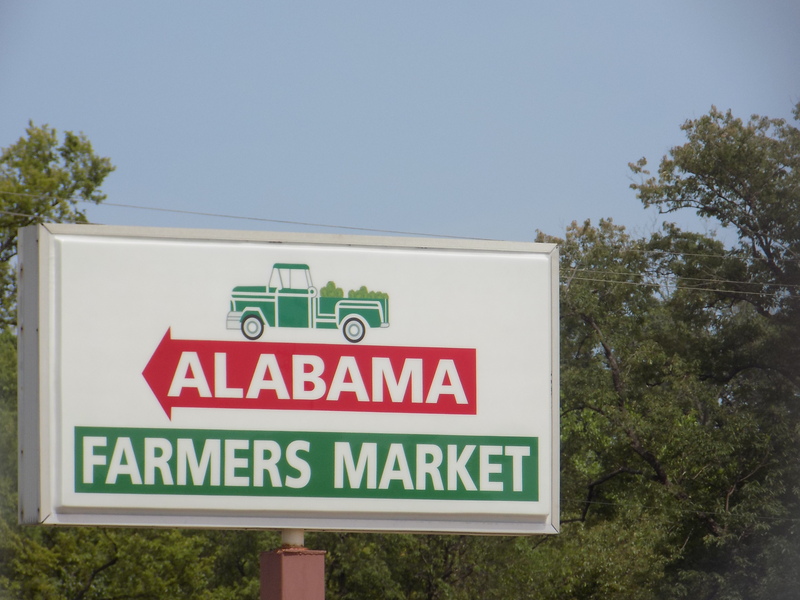 This entry was posted in Alabama Farmers Market on Finley Avenue and tagged Alabama, Alabama Farmers Market, Alabama farming, Birmingham, farmers market on Finley Avenue, farmers markets, Jefferson County Truck Growers Association, Pepper Place Market on August 10, 2016 by gedwardjourney. Well, well, Mr. Journey. We seem to be on the same wavelength recently. I was here yesterday and I bought 3 cartons of Chilton County Peaches, among other things. I also enjoy driving out here, while still hitting Pepper Place and about five other markets each month. JeffCo is the most reminiscent of what I remember farmer’s markets to be, and I will always be drawn here first. Excellent post, sir. Thanks, Mr. Bugbee. I have a soft spot for authenticity and Finley Avenue is the real deal.